Pecks at ground and leaps into nearby cooking fires. "Senses its destiny" and throws itself at nearby campfires, fire braziers, and the Little Wickerman, resulting in death. This pet is mailed to characters who've completed the Pilgrim meta achievement. Completing this achievement requires completing several other Pilgrim's Bounty achievements, some of which involve high level instances and PvP, during a very short span of time. For more information, take a look at Wowhead's Pilgrim's Bounty Guide. The Plump Turkey's special animation is to jump into any nearby cooking fires to cook himself, as he "senses his destiny." A good pet to use for capturing wild pets because of his Food Coma ability, which always hits. I'll hit a pet twice with it and then trap twice in a row. Even if it doesn't work, it at least sets up the trap for the next attempt. I lucked into getting two rare ones and I use them when hunting for rares quite a lot. Healthiest while still 289 power, at the cost of medium speed. 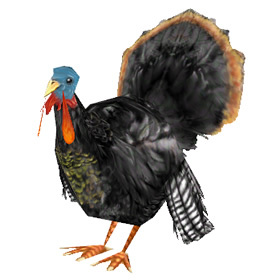 This will only be a problem against other flying pets, and you also still got Gobble Strike to speed up. Turkeys needs the power to make some damage, since it's attacks are otherwise nothing special. It does well against Aquatics, but can be very useful as a control pet with Food Coma. I would suggest finding a P/S breed Highlands Turkey instead of this one. But if you need more health Plump Turkey is the way to go. Does anyone know if this pet is still obtainable? I don't see the meta ach. in game. The Armory API says that this pet is not Tradeable, but I've seen it on the Auction House many times, so it looks like the Armory data may be in error. This little guy is one of my favorite pets to use. Not only is he super cute but whenever I'm having a little bit of trouble on a beast I just bring him out. His Food Coma move makes it easy to kill anything, especially the monkey at the Darkmoon fair. My Plump Turkey is shown as a rare in my journal and armory, however the listed stats for it only match uncommon stats listed here, not the rare stats. What happens if this guy stands by a nearby Lil'Ragnaros? Will it throw into Ragna's arms? Normally id be all for a nicely cooked Turkey. But then as a boomkin I look at it and realize that could be me some day... on the fire. My husband and I spent 10 minutes making campfires and summoning our turkies just to watch them hurl themselves into the flames. Can't really say I've ever laughed so hard when it comes to my pets. Only other time I laughed this hard was break-dancing on my hubbies' toon in his murloc suit. Be careful while you have this pet out, others who don't have it just love placing campfires in your path to see it's suicide animation. Finding a dwarf rogue to complete the meta achievement was fantastically frustrating, but ultimately worth it. New pets are always worth the hassle in the end, but this one goes the extra mile by having it mailed to you by the delightfully diminutive Breanni. One of only four such pets, I think? The turkey suicide has to be the greatest vanity pet action Blizzard has come up with. Wish they would have similar complex actions to other pets like having the whelps breathe fire on nearby pets similar to K.T. 's freezing. All we can hope is that this is a new trend! How odd.... Spring Rabbit and Plump Turkey will fall in love and make baby rabbits. But poor lonely turkey. (from the turkey caller) gets no action. Update July 2010: It appears they have corrected the turkey and spring bunny making baby bunnies. My turkey was unlucky in bunny-love today. I got the achievement on my first try on my main, and 2nd try on my alt. Very easy to do with tracker snacks! For the turkey shooter, do not shoot anyone already transformed, you'll waste a shot. Let me tell you about Plump Turkey. This pet has a death wish! No matter how much you try to convince it that life is worth living, his one goal is to hurl his pathetic feathered body atop a flaming campfire. He believes that it is his duty, nay, his destiny, to become your next dinner! Pleading, attempting to convince him of his own free will does nothing. Like the Elwynn Lamb, this pet will only abandon you and make you confront your own mortality. Do not bring Plump Turkey to your raids, he likes to jump in the fire. He's humble, clairvoyant, and delicious with cranberry sauce.